We asked Brandon Schroeder, Michigan State University (MSU) Extension Sea Grant educator, to share with us about a strategic connection he has made that has strengthened his impact. Brandon’s current programming efforts involve fisheries science, biodiversity conservation, sustainable coastal tourism and Great Lakes education: working with coastal communities in northeastern Michigan to apply science-based knowledge to address Great Lakes issues locally. “I value my Extension role in making connections and building relationships, and believe it’s an important role we play in our communities,” Brandon said. Will you tell us about a strategic connection you’ve made? One successful educational partnership I’d like to highlight is with the statewide Great Lakes Stewardship Initiative (GLSI) and our leadership for the Northeast Michigan Great Lakes Stewardship Initiative (NEMIGLSI) network. These relationships reflect rich connections made between schools and educators across northeastern Michigan – and the entire state – as well as fostering greater school-community partnerships. This place-based stewardship education initiative seeks to engage youth, through their learning, in environmental stewardship projects that make a difference in the community – and so youth also are connected as community partners. How did you go about making the connection and building relationships? Seeking organizational partners, building personal relationships: Early on, we identified an opportunity (with funding) to partner with the Great Lakes Fishery Trust and an emerging statewide GLSI network. With this in mind, we sought out and met regularly to recruit potential school and community partners who had mutual interests in connecting Great Lakes and natural resource stewardship with school learning opportunities. Networking in regional meetings to foster relationships: In 2006, collaborating with 4-H colleagues, we hosted and facilitated the first of many regional networking meetings inviting school and community partners who had much to contribute and to gain in this Great Lakes and natural resource education conversation. This was an educational workshop also designed to serve a networking function by facilitating relationship-building and resource sharing among schools and partners. Conversations sparked during our first regional networking meeting, now an annual tradition, became the foundation for the NEMIGLSI partnership. Facilitating an engaged leadership team: A regional leadership team for the NEMIGLSI was established and helped launched the initiative. This regional team still meets regularly to coordinate our educational efforts, provide shared leadership in implementing activities and collaborate around new opportunities (and securing new resources) for our growing NEMIGLSI network. Our leadership team is more than an advisory group; they are active contributors and beneficiaries in this joint programming. Sharing investment, sharing successes: Leadership team partner organizations – community, school and teacher advisors – contribute significant time, expertise and resources toward NEMIGLSI network goals. In trade, we work to ensure that network programming and successes align with their own goals and educational initiatives. What has been the outcome of this connection and how has it influenced your work and your district? Our NEMIGLSI network and partnership is successfully fostering a growing place-based education culture in northeastern Michigan. Since 2009, more than 19,000 students (around 20 percent of student population annually) have engaged as Great Lakes stewards and valued community leaders through NEMIGLSI. This initiative has supported more than 35 schools (290 educators) from eight counties in professional development, community partners connections and stewardship project support. Numerous NEMIGLSI student projects have directly benefited Sea Grant and partner priorities helping to conserve Lake Huron’s biodiversity, map threatened and endangered species habitat, restore native fisheries, monitor water quality and vernal pool wetlands, manage invasive species, enhance aquatic habitat, investigate marine debris and more. A published program evaluation found that students value their learning experiences as hands-on and engaging, community connected, career oriented and fun. Perhaps most exciting is that students are serving as valued community and conservation partners today – and perhaps even more in their future! Schroeder engages students in wetland ecology: invasive phragmites monitoring. What have you learned (personally or professionally) from this connection? Embrace the power in partnerships! We can all cover more ground more efficiently and effectively, and achieve deeper, richer impacts as a result of collaborative programming. Relationships and connections (or partnerships) are both organizational AND personal. They demand significant time, energy and a bit of patience to foster, and require ongoing attention, commitment and care. Relationships and partner connections are equally important to our science or technical content expertise, and the educational processes and methods we use to deliver this content in communities. In Extension, I have found the most vibrant and exciting projects to be at the intersections of stakeholders and opportunities that wouldn’t normally (or as regularly) cross paths. For example, connecting schools, educators and youth with Great Lakes scientists or community development partners. Many times I find that community expertise, ideas and resources abound once we have simply helped open a door for networking and relationship-building. Thanks again to Brandon for taking time to share with us about his strategic connections. One of our great strengths in Extension is our ability to bring people, organizations and resources together to make a profound impact on our state. Each month, I’ve shared a story from each district highlighting strategic connections our colleagues have made in hopes that it will inspire all of us to reach out. A story in MSU Today titled “On the Lookout for Invasive Plants” features Dr. Jo Latimore. Dr. Latimore is an academic specialist in the Michigan State University Department of Fisheries and Wildlife with MSU Extension funding who contributes to the work of the Greening Michigan Institute. The article tells how she heads MSU’s part in the Michigan Clean Water Corps Cooperative Lakes Monitoring Program, a statewide initiative of which MSU is an integral partner. The primary purpose of this cooperative program is to help citizen volunteers monitor indicators of water quality in their lakes and document changes in lake quality over time. Volunteers are trained to spot invasive weeds that grow beneath the water’s surface. 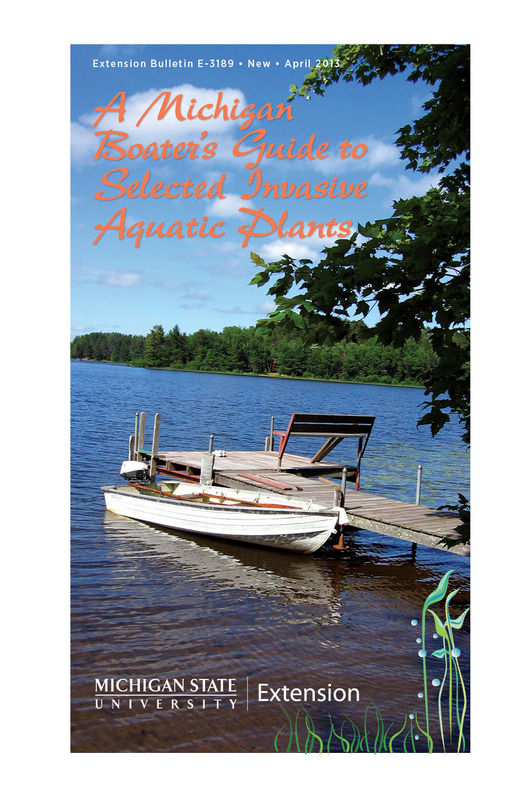 The Michigan Department of Environmental Quality uses the information for their work in removing invasive species from lakes. Read more in the article. Thanks to Jo for her leadership in building capacity among volunteers dedicated to stewardship of Michigan’s valued inland waters.